Hi you all!!!! It maybe looks like there isn’t happening very much, but I’ve been working on some crochet and knitting projects, related to a yarn review. I had reasons to put part of it out on my Dutch channel with some priority, because I wanted to support my favorite yarn supplier (De Wolman). So that took some time that I couldn’t spend with you here. 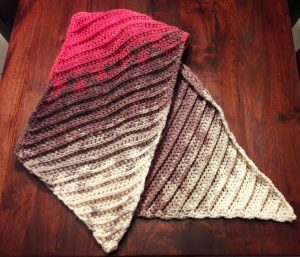 If you’re curious, you can go to my Dutch website (www.dehandwerkjuf.nl) or see the instructions for the crochet shawl I designed here. I didn’t translate it there yet, and it will be here on this website also, so just be patient if you really don’t understand at all 🙂 . And of course you can also watch the Dutch video’s for it. But the English versions of my video’s will also get here in a short while! I had 2 more video’s for you waiting, and today I published the first. These last 2 (for some while), are related to each other, because they are really in depth video’s on how to do the corners when doing crochet borders around your weave. It always kind of bothered me a bit, that the fact that you don’t have the same number of loops around your weave, made me kind of ‘work around’ it. I didn’t have a consistent way of working for it, that was really thoroughly thought through (wow, I think I typed that correctly right away, hehehehe). So I started to draw, think, try out, and this is what I came up with. I also made a elaborate tutorial on this website here, and down on this page is the link to the video. I hope you will enjoy it, and hope it is really helpful.